Neben dem Grand-LIA holte Serviceplan zudem zweimal Gold, dreimal Silber und fünfmal Bronze. Aus Deutschland konnten sich neun weitere Agenturen über Preise freuen. Neben Serviceplan schnitten Saatchi & Saatchi (dreimal Gold, zweimal Silber), Kolle Rebbe (dreimal Gold, je einmal Silber und Bronze) sowie BBDO Proximity in Düsseldorf und Berlin (zusammen genommen zweimal Gold, fünfmal Silber und zweimal Bronze) am besten ab. 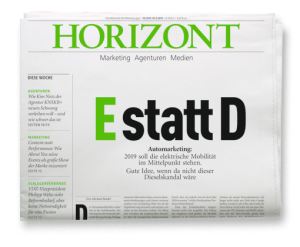 Ogilvy und Ogilvy Action (heute Geometry Global), Cheil Germany, TBWA, DDB Tribal, Storz & Escherich sowie German Wahnsinn komplettieren das deutsche Siegerteam. Insgesamt ergatterten die hiesigen Agenturen 41 Awards (einmal Grand LIA, zehnmal Gold, 19 Mal Silber, 11 Mal Bronze). •	Grand LIA in Design - "The Selfscan Report"
• Gold LIA in Eco-Design - "The Selfscan Report"
•	Gold LIA in Radio - Innovative Use of Radio for BMW 5 series titled "BMW Siri"
•	Silver in Design - Client Promotion for Killnoise "Kill Noise Earplugs"
•	Silver in Design - Non-Profit for Alive e.V. Coalition to Abolish the Death Penalty "Troy Davis - I am alive"
•	Silver in Non-Traditional - Live Events - Beyond Advertising for SKY titled "SKY Livespots"
•	Bronze in Digital - Visual Design for Auchan "The Selfscan Report"
•	Bronze in Design - Branded Content for Fyffes "Banana Comic Week 2013"
•	Bronze in Design - Direct Marketing - Consumer for Fyffes "Banana Comic Week 2013"
•	Bronze in Design - Art Direction for Alive e.V. Coalition to Abolish the Death Penalty "Troy Davis - I am alive"
•	Bronze in Design - Digital Installations for MINI “Not Normal. MINI Rear Windscreen TV." •	Gold - Non-Traditional - Branded Content for "Days of Hope"
•	Gold - Non-Traditional - Guerilla Marketing for "Days of Hope"
• Gold - Non-Traditional - Live Events - Beyond Advertising for "Days of Hope"
•	Silver - Integration for "Days of Hope"
•	Silver - TV/Cinema/Online Film - Innovative Use for "Days of Hope"
•	Gold - Radio - Campaign for Deutsche Lufthansa Intercontinental Flights titled "The Poetry of The USA" and "The Poetry of Asia"
•	Gold - Radio - Script Writing for Intercontinental Flights titled "The Poetry of Asia"
•	Gold - Radio - Script Writing for Intercontinental Flights titled "The Poetry of The USA"
•	Silver - The NEW for Haelssen & Lyon titled "The Tea Calendar"
•	Bronze - TV/Cinema/Online Film - Music & Sound -- Music Original – Underscore for Sven Helbig-Pocket Symphonies titled "Rebirth"
•	Gold - Non-Traditional - Branded Content for WWF titled "The Ant Rally"
•	Gold - Non-Traditional - Public Service/Social Welfare for WWF titled "The Ant Rally"
•	Silver – Print - Art Direction Campaign for Westlotto / 6by49 - Six Lucky Numbers Campaign titled "Champagne", "Yacht", "Plastic Surgery", "Pony" and "Golf"
•	Bronze - Non-Traditional - Live Events - Beyond Advertising for WWF titled "The Ant Rally"
•	Silver - Print - Direct Marketing - Business-to-Business Campaign for ZMG (Newspaper Marketing Association) titled "The Other Side of Newspaper"
•	Silver - TV/Cinema/Online Film - Production | Post-Production - Low Budget for Supporting Homeless People titled "The Art of Survival"
•	Bronze - TV/Cinema/Online Film - Production | Post-Production - Cinematography for Supporting Homeless People titled "The Art of Survival"
•	Silver - Non-Traditional - Live Events - Beyond Advertising for BUND titled "Tree Concert"
•	Silver - Non-Traditional - Public Service/Social Welfare for BUND titled "Tree Concert"
•	Silver - TV/Cinema/Online Film – Automotive for smart fortwo titled "Offroad"
•	Silver - TV/Cinema/Online Film – Copywriting for smart fortwo titled "Offroad"
•	Silver - TV/Cinema/Online Film – Humour for smart fortwo titled "Offroad"
•	Silver - Digital	- Public Service/Social Welfare for United Nations Campaign Against Forced Marriage titled "Free The Forced!" •	Silver – Design - Direct Marketing - Business-to-Business for Kontor Records titled "Back to Vinyl - The Office Turntable"
•	Silver - Non-Traditional - Direct Marketing for Kontor Records titled "Back to Vinyl - The Office Turntable"
•	Bronze - Non-Traditional - Business-to-Business for Kontor Records titled "Back to Vinyl - The Office Turntable"
•	Silver - TV/Cinema/Online Film - Music & Sound - Music Original – Song for BMW MINI Next titled "MINI Next Family"
•	Silver - TV/Cinema/Online Film - Production | Post-Production - Low Budget for Carabao Fitness Center titled "Carabao - Beat your kilos"
•	Bronze - TV/Cinema/Online Film - Production | Post-Production – Direction for Volkswagen Sign Assist titled "Pedro"
•	Bronze - TV/Cinema/Online Film - Music & Sound - Sound Design for Herbaria titled "Fears"